Believing in GOD and praying with all your heart makes impossible things possible. I would like to share with you one such experience which has happened in my family. My brother-in-law phoned me that day. I told him to bring him here for Blessings of Swami and told him that we shall pray. [ Since then we started to apply Vibhuti while chanting the vibhuti mantra four times every day.] They came to Puttaparthi, next day along with me boy sat for darshan. 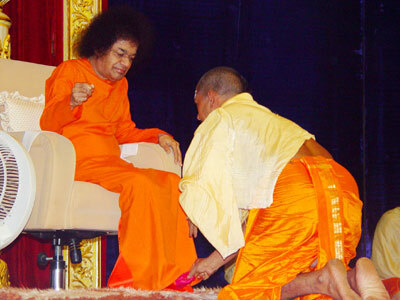 Swami came and gave him vibhuti and said "Do as the doctor said. My Blessings are there". They went to Nagpur Mayo Hospital and admitted him for surgery. After all the investigations and X-ray report all the con­cerned doctors held a meeting and they referred him to Tata Memorial Hospital in Bombay . At the Tata Memorial Hospital. after the examinations they started chemo­therapy to reduce the size of the tumor. As per the tests and CT-Scan report the doctor said that there is only 5% hope of life because the cancer had spread to the ribs lungs and is spreading over the kid­ney. They also declared it as PNET tu­mor. After five chemo-therapy sessions the tumor size had reduced so much that the doctor advised for surgery. As the ninth rib was affected it had to be re­placed. Before surgery they asked us to bring an artificial rib which is needed for the surgery, which we brought. Surgery was done successfully and doctor said that the rib was alright and did not need replacement. And the lungs and kidney were also alright. After the operation the doctor advised for radiation therapy. But after examination and seeing the reports they said radiation was not required they would just complete the chemo-therapy course only.